Our new president, Obama is determined to halve the federal deficit by 2013. and raise taxes for "the wealthy". While it is good news (at long last) to see a fiscally responsible government, it means that money will not be changing hands faster any time soon. Deflation, is here to stay. Deleveraging will continue, mortgage rates have not bottomed yet. Unemployment should keep on rising. Plan your financial futures accordingly. Another week has passed, and our system have been further tested. As I explained and wrote before, I had to switch from Marketocracy.com to another 3rd party auditing system to track my performance in a more realistic way. I looked at a few and chose UpDown.com. The UpDown.com site is much more responsive, easier to place trades on, allows shorting, has an up-to-date ETF database, among other advantages. With the help of UpDown.com, I'm happy to report that once again, PIE has finished the week positive, and no less importantly, with lower volatility than the markets. 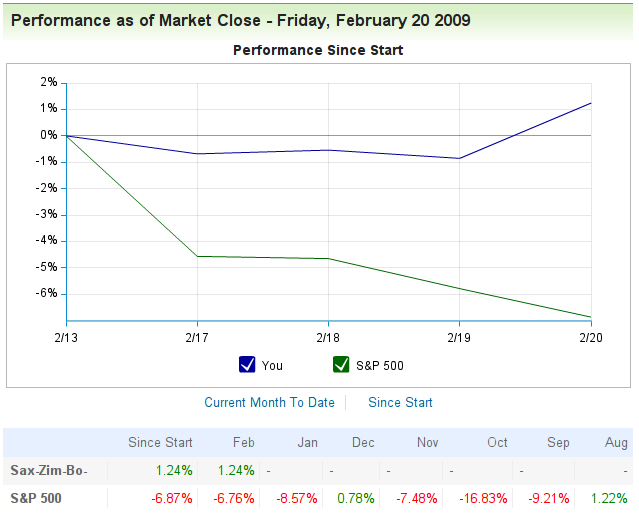 It ended up 1.24% for the week, while the markets sank to new lows with the S&P500 dropping by another %6.87. UpDown's registered user base has been rising fast. They already have 31,113 accounts. My account advanced by 5,264 slots this week to finish 4252 out of 31113. The current precentile rank is 13.6%, the top ranking members seem to be trading continuously troughout the day, something I cannot afford nor want to do, so I'd be happy to get to the top 5% percentile or there abouts and stay there. Anyway, there's more work to do in the coming weeks and months.